This is awesome, both for happening and for someone (you) catching it. Thanks for sharing! Hi John, do you ask people's permission to post their photos on your blog? Once, in about 1995, I saw a guy sitting in an all-night diner, giggling incessantly over the book he was reading. On closer inspection, the book was "How to win at Nintendo games," about 1988 vintage. We couldn't figure out what was going through his mind, but we finally decided it must be, "HA! That's ridiculous! I can beat "Contra" in HALF that time. Up-down-up-down-left-right-left-right, etc." Either that or he was just crazy. He's got very angry-looking eyebrows. Says here the book is written by the son of a shoemaker. Probably cobblers, then. Do please check to ensure you're not now a toad! A wizard who can't be bothered to brew his own coffee? I suppose he's got bat testicles, rat brains and the likes in the pantry, but no instant coffee. My first thought was "BILL BAILEY!" What is he doing so far away from Ankh-Morpork? 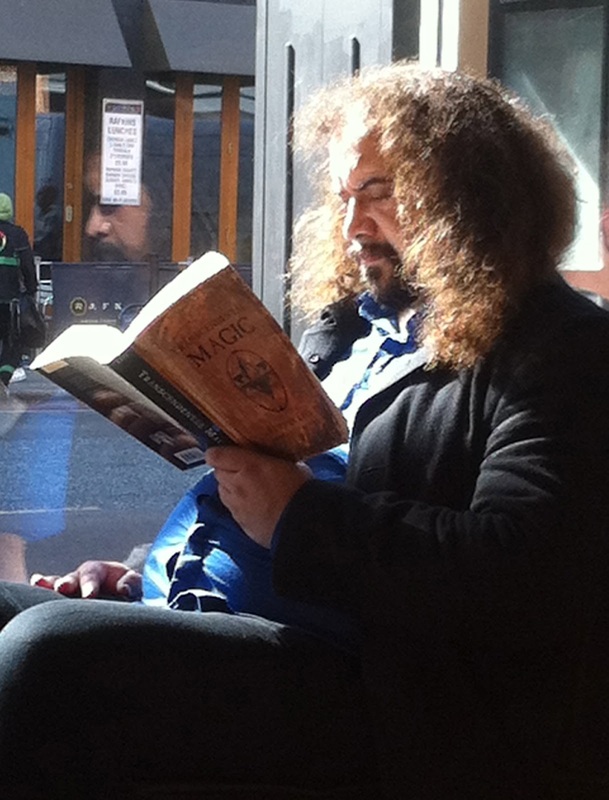 On another note, I met a genuine Satanist in a bookshop once. This little old man with white hair. You know what's really weird? Nicest guy I ever met. Honestly, wouldn't hurt a fly. Weird. I never got the concept of over paying by 300% or more for a cup of coffee. I make mine in the morning, put it in a thermal cup and I'm good to go. No magic in that, just common sense for not wanting to waste money. Can't wait for the next installment of Cabin Pressure. Maybe Martin can learn how to make just one cup of coffee! He may not be a wizard but . . . are you sure he's not a knight or something? His hair and beard remind me of one of King Arthur's knights. In fact, I almost expect him to shout "Ho wench! Go forth and brew my latte! I have a quest to finish for milady!" Don't laugh at him because he's a real wizard who could put a terrible spell on you ! His whole power is in his hair, any volunteer to cut it ? I've got that book-its a riot! I think it might be Alan Moore's avatar. Apparently he's a wizard and worships some Roman snake god. He'll be at home moaning about Hollywood and blowing his nose on £20 notes and the avatar says "sod this for a lark" and goes off for a poppy seed muffin and an americano. It might also be Hagrid. Easy to confuse the two. Was it a "Mwah-ha-ha" type laugh, with related rubbing of hands/twirling of moustache? This is brilliant! xD Thanks for sharing. It happens to be my birthday too today, and I was very honoured to discover I have such a spectacular birthday twin. I hope you are having a very lovely day. Brilliant! I love birthdays! Many happy returns, Mr F.
Happy Birthday Mr. Finnemore!! Best wishes from Romania! here's hoping that you have a lovely birthday on which you are appropriately celebrated and showered with a lot of nice and quirky presents (or useful ones, whichever you prefer)! Thank you so much for all the laughs! Aren't you in fear of revenge now that you've revealed their secret? Happy birthday from The Netherlands. You are absolutely amazing! Happy Birthday to the brilliant you! Happy birthday and many many happy returns! I love seeing people enjoying what they're reading, although I was embarrassed once to realise that of the two books I had taken with me on a flight, one made me laugh uncontrollably and the other made me cry. I wish there had been a wizard on the flight. Or a few episodes of Cabin Pressure. I'd go berserk if anyone (even you) posted my photo without having asked for my permission (which I'd never give). Did you ask? Besides, I love your work! What has become of Radio Four Continuity? Cabin Fever? Cabin Fever! Honestly, such ignorance. It would never have happened on Charlotte Green's watch. I must say that your writing style's changed a bit since you penned 'Cabin Fever'. Maybe they still have the same announcer who introduced "The go on show all those years ago"? I'm much enjoying the new Souvenir Programme series. Very, very much. Thank you. Is it a good or a bad sign that I own that book? My hair looks better though. I hope. Did he not catch onto you at all looking at him...or even a follower of you and now see this picture of himself and the comment you left? Is there any update to when cabin pressure will air again. I knew they're among us, muggles!